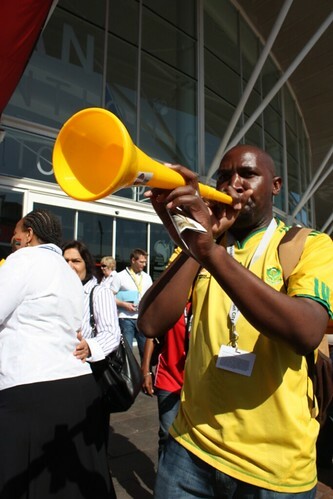 A vuvuzela, is a stadium horn, is a blowing horn approximately 1 m (3 ft 3 in) in length, and it is made by plastic. It is commonly blown by fans at football matches in South Africa. The instrument requires some lip and lung strength to blow and emits a loud monotone B note. A similar instrument (known as corneta in Brazil and other Latin American countries) is used by football fans in South America. The Confederations Cup FIFA received complaints from multiple European broadcasters who wanted it banned for the 2010 FIFA World Cup because the sound drowns out the commentators. Prior to the event Netherlands coach Bert van Marwijk and Spanish midfielder Xabi Alonso also called for a ban, the latter saying the horns make it hard for players to communicate and concentrate while adding nothing to the atmosphere. During the 2010 FIFA World Cup, Hyundai and a local South African advertising agency called Jupiter Drawing Room created the largest working vuvuzela in the world — 114 feet (35 m) long — on an unfinished flyover road in Cape Town. The vuvuzela is powered by several air horns attached at the mouth piece end, and it will be blown at the beginning of each of the World Cup matches. The next video a vuvuzela maker talks about the tradition of the South African football and the vuvuzelas. » Vuvuzela: Will it blend? What a let down. I can not even watch the world cup on my tv in New Zealand, it is the most irritating … horrible… Terrible noise I have ever heard. We can’t hear the old singing or cheering, just a monotonous drone of this pipe from hell. PLEASE FIFA BAN this thing so we can watch the rest of the world cup in piece! I don’t even want to watch the rest of the games because of this thing called the vuvuzela. What does that mean anyway? Horn from hell! ?